Life has a habit of throwing the greatest of curveballs when you least expect it. And in Bhumi Collective’s latest production, they’ll be tackling the story of one man who finds his once clear path now at a crossroads when faced with an unexpected crisis. 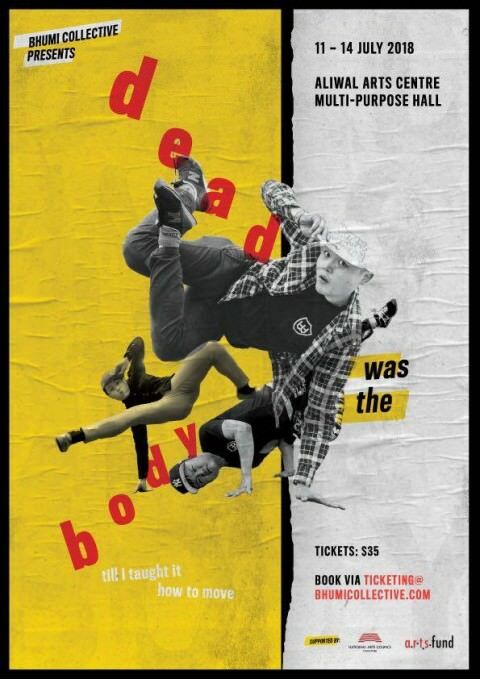 Written by Edward Eng, directed by the Second Breakfast Company artistic director Adeeb Fazah, and with dramaturgy and movement direction by Michael Ng, dead was the body till i taught it how to move makes its world premiere this July before touring internationally in the months to come. The play tells the story of Singaporean university student Dom (Dominic Nah), a man who encounters the unexpected death of his father while he’s away at his studies and discovers the art of b-boy dance. For Dom, b-boy dance keeps him engaged in street culture, keeps it real, and helps him stay true to himself. But for that to translate into real life is a struggle, and authenticity manifests in uncontrolled aggression towards his peers, a constant impulse to steer himself away from success, and an unresolved hatred towards his late father. As such, he ventures on a quest into the Bronx in New York City to find the grandfather of hip-hop, attempting to revisit his own confused biography and understand the position he’s found himself in – the need to become a role model in his future career as a teacher, while struggling to find one to model himself after. All Dom knows is that “the key is in the moving”, so move with Dom and Bhumi Collective, take a closer look at his own personal struggles and pressures, and come alive at the Aliwal Arts Centre this July with dead was the body till i taught it how to move.